Justin's WeatherTalk: Rainbow! A little science. A little change in fortune. Rainbow! A little science. A little change in fortune. Infared is the wavelength just beyond the red. It is the part of sunlight (just outside of the visible range) that is responsible for heat. That is why heat lamps at cafeterias, or rest stop food joints are often red. It is also why you feel warm when the sun shines on you. This wavelength is somewhat long and doesn't penetrate the skin, but just at the surface results in molecules speeding up and producing heat. Ultraviolet is just beyond the violet. Also something we can't see, UV is responsible for tanning and burning of our skin. It has a smaller wavelength that can penetrate the skin and cause our bodies to react with melanin... etc, etc, etc. So all of the colors have their place, and since red has a longer wavelength, it does not refract or bend much. Violet has a much shorter wavelength, so it bends the most and ends up on the inside of the arch with the sharpest curve. The result: Red will always be on top, with Violet on the bottom.... for a primary rainbow. Not all rainbows are the same...Jim was able to capture this rare double rainbow. The conditions have to be nearly perfect for this. 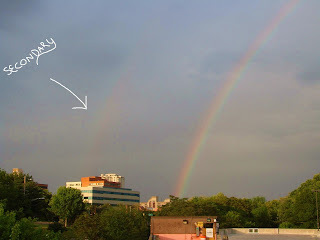 While we can often see a rainbow based on sun angle usually after 4pm or so, a double rainbow usually occurs within the last hour of sunlight. A shorter window of opportunity. You also need to have a wide open view that is not blocked by trees, hills, or buildings. 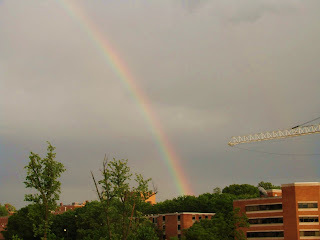 The secondary rainbow is much fainter- almost hard to see, but will act like a reflection of the first. So the colors will be in reverse order- with red on the inside and violet on the outside. Now I am tempted to go get a box of lucky charms. If I could only find $2.50 gas at then end of these I would be happy. Well we have the weather to bring us happiness now. One last disturbance will bring us clouds and some showers on the north side today- but then we turn the corner. The pattern will flip for the nation. Cooler weather out west, while we get a ridge of High Pressure to build back in. more sun and an eventual shift to a southerly wind still promises a sunny, dry weekend. Here are the Sunday maps from the GFS. 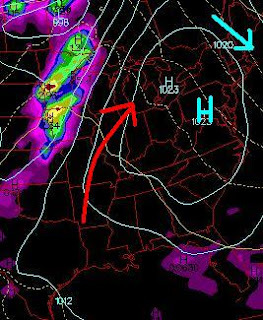 The surface maps show High Pressure overhead, which means sinking air. That translates to sunshine, and light wind- which will shift to the southwest by Monday. The color map shows the 850mb temperatures. The yellow/orange shows temperatures at 5,000Ft around 15C. That will translate to surface temperatures back into the upper 70s. 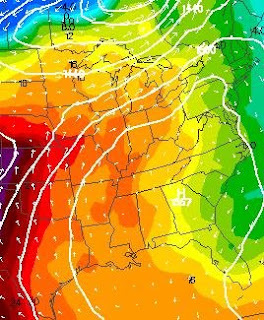 I see us back to the low 80s by Memorial Day.